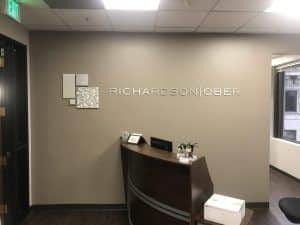 Richardson|Ober PC is a full-service law firm specializing in community association law, real estate, business, and construction litigation. A few years back, we made a couple of interior logo signs for their Pasadena office. They recently made a few changes to the company and the logo, so they reached out to us to update their sign to reflect the changes. 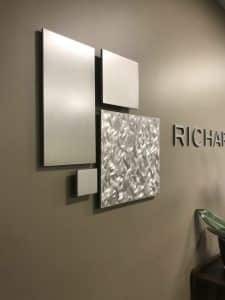 Richardson|Ober serves community associations throughout California with offices in Pasadena, Costa Mesa, and Riverside. They are nationally and locally regarded for consistently responding to each client’s unique legal needs in a direct, practical, and results-oriented manner. Because of this, they have been in business for almost 30 years demonstrating a commitment to achieving results with honesty, integrity, and an overriding attention to detail. Their attorneys are regularly invited as speakers at community association law forums and real estate industry events. They develop courses for realtors, residents, and community association managers providing ongoing professional development to community association leaders, volunteers, and other professionals within the industry. We made them a new lobby sign from aluminum dimensional letters and installed the sign above the reception desk. The lobby or reception area is the best place to display your logo if you are a professional office. The lobby or reception area is the first room that a visitor will enter so having your logo displayed there as a high-end sign is a great way to make a good first impression. 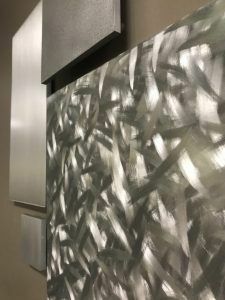 Metal signs are very popular with professional offices because they have a very high-end look, and silver finish metals like aluminum can go with many different patterns and textures included in your interior decor. As you can see from the photos, the sign looks great against the new paint color and the reception desk. 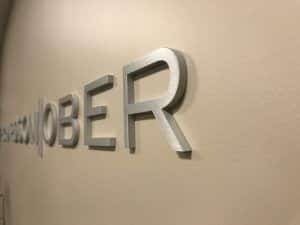 Due to the metal sheen, aluminum letters even look great on plain white walls.